Author John Clayton credits his parents for instilling in him an interest in national parks. Clayton’s latest book is Wonderlandscape: Yellowstone National Park and the Evolution of an Cultural Landscape (Pegasus Books). His book describes, through 10 examples ranging from the first “official” explorations of the area in the early 1870s that would become the world’s first national park. From the park as a destination for area dude ranchers, Clayton tells different stories about Yellowstone. When the park became an outdoor laboratory, Clayton focuses on the wildlife biologist brothers Frank and John Craighead, who brought radio collars and other scientific study to grizzly bears. Everybody’s favorite picnic basket-stealing bear, Yogi, who lived in Jellystone National Park, was another cultural touchstone. “No other national park has a cartoon character — except for Yosemite Sam,” Clayton laughed. But Yosemite Sam didn’t spend much time in Yosemite National Park, so he doesn’t really count, he joked. Ironically, Clayton’s mom didn’t let him watch Yogi the Bear cartoons, but she approved of another character, Bugs Bunny. “She was able to justify Bugs Bunny for its cultural significance,” he quipped. Clayton (pictured above) has lived on Yellowstone’s northeast doorstep — Red Lodge, Montana — for more than 25 years, but he grew up in Massachusetts. In the summers when he was a kid, mom, dad, Clayton and his sister piled into a Volkswagen van for a national parks road trip, Clayton said recently. “My mom was a teacher, so this was part of our education,” he said. They never made it all the way to Yellowstone, but they saw the Liberty Bell in Philadelphia where they learned about liberty, for example. Clayton learned during that time that national parks are “magical, natural places but also cultural touchstones,” he said. There’s a cultural overlay to Yellowstone, Clayton says, beyond the park’s geology, animals, intact ecosystem and gorgeous scenic vistas. “I’m fascinated by place, and I wanted to write about place,” he said. He wrote an earlier book about Red Lodge, but it wasn’t a big seller. “And then it hit me: I live next door to a place that attracts 4 million visitors a year,” he said. Then, Clayton said, he just started reading, and the idea of the park’s recurring cultural transformation struck him. Then it was a matter of identifying a transformation and finding a story to illustrate it. He found 10. With other writing jobs and other issues in his life, Wonderlandscape took about six years to complete. 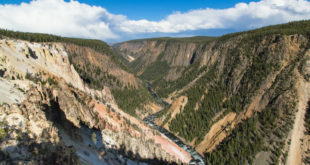 The title comes from a combination of the word landscape and “Alice in Wonderland.” When Yellowstone entered the popular culture in the late 1800s, Lewis Carroll’s book “Alice in Wonderland,” published in 1865, was still popular in the public’s imagination. So Yellowstone’s fantastical scenery and geologic wonders such as mud pots and geysers was often referred to as “Wonderland” in early publications and advertisements. And does Clayton have a favorite part of Yellowstone? He replies that he does — Canyon. He said he is particularly moved by the artwork of Thomas Moran, the painter who accompanied the Hayden Expedition of 1871 to Yellowstone. Moran painted dramatic landscape scenes of the park, and is perhaps best known for his scenic paintings of the Lower Falls of the Yellowstone. He also likes to watch the people at Artist Point. Clayton said his book is doing well. It was reviewed by the Associated Press and nominated as an “Editor’s Choice” at Amazon.com. Clayton is currently a scholar in residence with the U.S. Forest Service at the Grey Towers National Historic Site, the ancestral home of Gifford Pinchot in Milford, Pennsylvania. Pinchot is credited with founding American conservation efforts in forestry. Clayton is working on a book exploring the friendship between Pinchot and renowned conservationist John Muir, who co-founded the Sierra Club.